To take a number of pictures of a subject set within a large even background and how the positioning of the main subject impacts on the asthetic quality of the photograph. For this exercise I dug back into my portfolio (as agreed with my tutor) to a photograph I took back in April 2009. 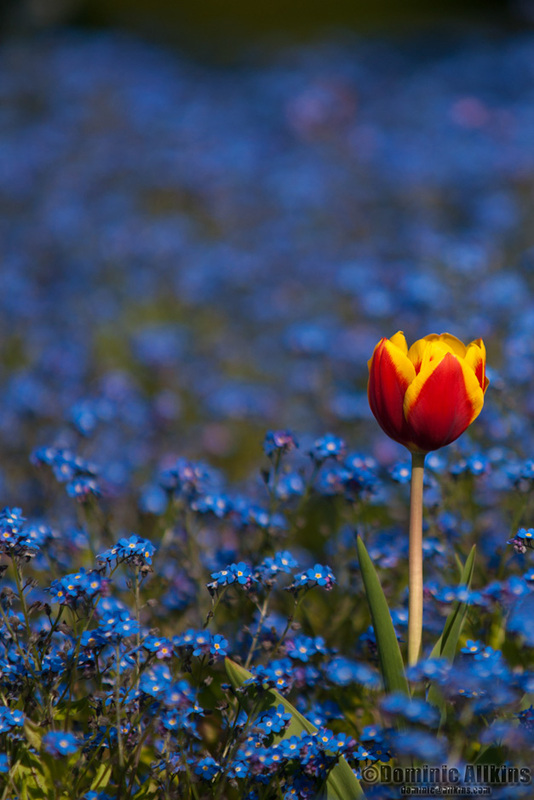 Whilst out with my girls in their home town, at the entrance to the park was a beautifully cared for public garden with bright red and yellow tulips set against blue ground flowers. It immediately struck me how the contrast between the colours could create a lovely image. For the purposes of this exercise I selected the best of the shots and cropped to create a similar effect to taking different pictures. The picture was taken with a Sony Alpha 900 with the Sony 70-200G lens at 200mm. 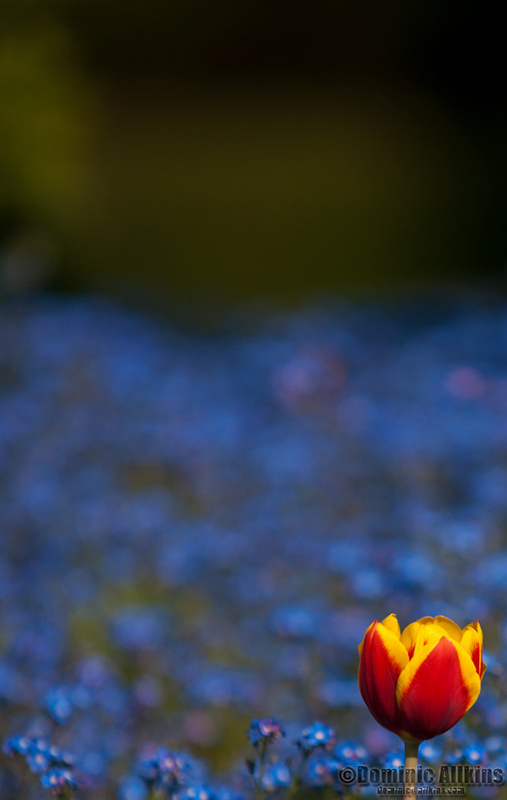 Aperture was wide open at f2.8 to ensure a shallow depth of field which would make the tulip stand out even more from the backdrop. The original intention of this picture was to create a cropped version from the original (the advantage of having 25 megapixels with the A900) so it was deliberately taken with the tulip in the centre of shot to make sure is was perfectly focussed. This was the base image from which all crops were made. 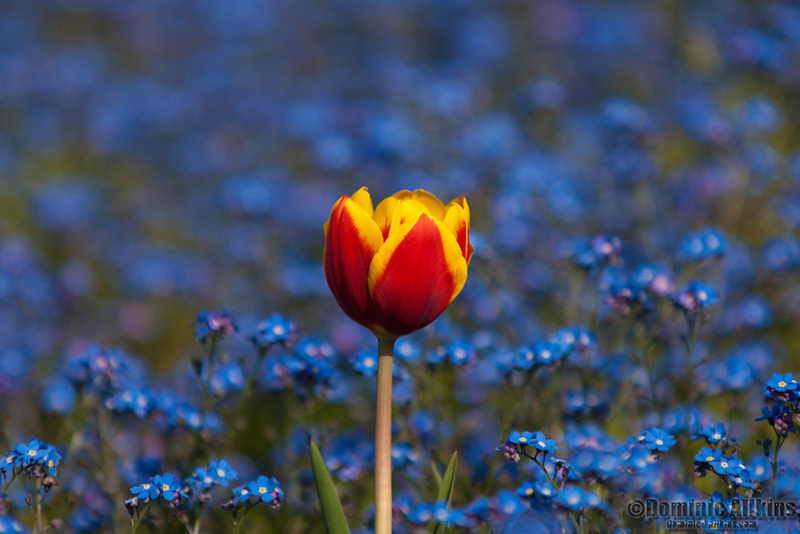 While the impact of the red & yellow tulip against the low ground blue flowers is obvious, positioning the flower in the centre of the frame makes the image feel somewhat imbalanced – in spite the exact central positioning. 7.1: The base image - portrait with the tulip in the centre of the frame. Positioning the tulip to the right of the frame gives a much more pleasing composition. 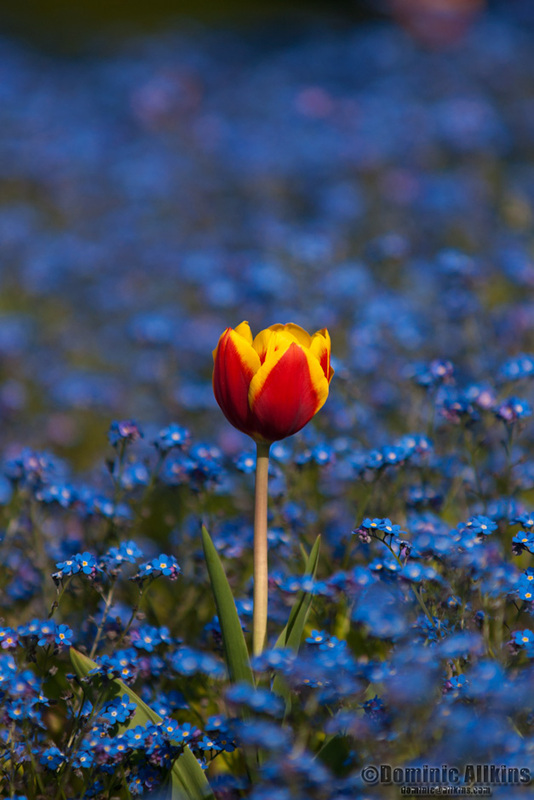 The prominance of the tulip is counter balanced by the mass of blue to the left. 7.2: A portrait crop with the tulip in the right centre of the frame. Cropping so the tulip is positioned to the lower right gives a more pleasing composition still. 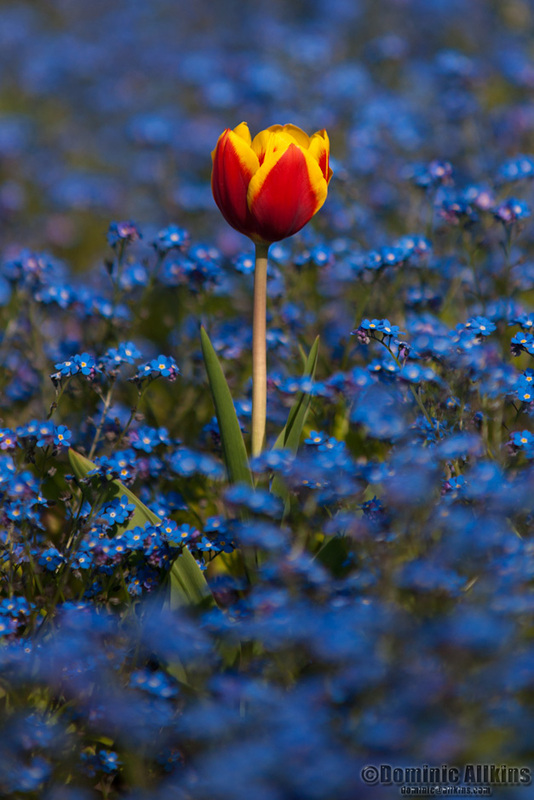 The eye is drawn to the colours of the tulip but in a wider context. 7.3: A portrait crop with the tulip in the lower right of the frame. Positioning the tulip in the extreme lower right of the picture, whilst certainly preferable to the ‘centre shot’ now seems to re-introduce an imbalance into the picture. Nonetheless there is still a very attractive aspect to the picture. 7.4: A portrait crop with the tulip in the extreme lower right of the frame. Re-positioning the tulip to the upper centre of the frame is probably the least pleasing of the portrait compositions. There is too much foreground which draws attention. There is a lack of balance in the framing. 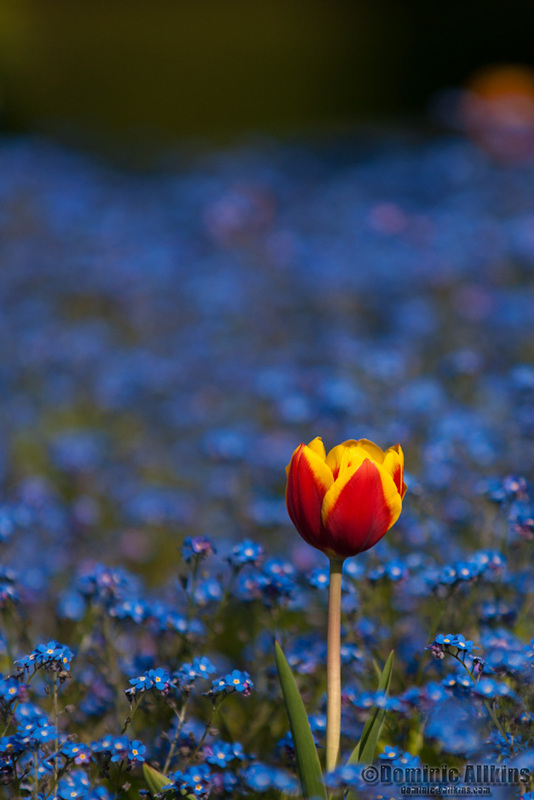 This was true for all compositions with the tulip top of frame. 7.5: A portrait crop with the tulip in the high centre of the frame. I also created some landscape crops as a comparison to the portrait versions. Having decided originally on a portrait composition, cropping landscape brings (to me personally) some more pleasing compositions. As with the portrait crop, positioning the tulip in the centre of the frame, while perfectly balanced in a ‘technical’ perspective introduces an asthetic imbalance. It’s a pretty picture but not a pleasing composition. 7.6: A landscape crop with the tulip in the centre of the frame. Re-cropping with the tulip to the left of the frame is better, but still lacks balance and contains too much foreground, drawing the eye away from the main subject. Positioning the main subject in the lower right (or left) of the frame gives a much better composition. There is a nice balance between the positioning of the subject and the rest of the frame. This composition is a prime example of the rule-of-thirds and how effective the rule is in giving pleasing composition. 7.8: A landscape crop with the tulip positioned in the lower right corner. Positioning and framing are key to both the balance and aesthetics of a picture. 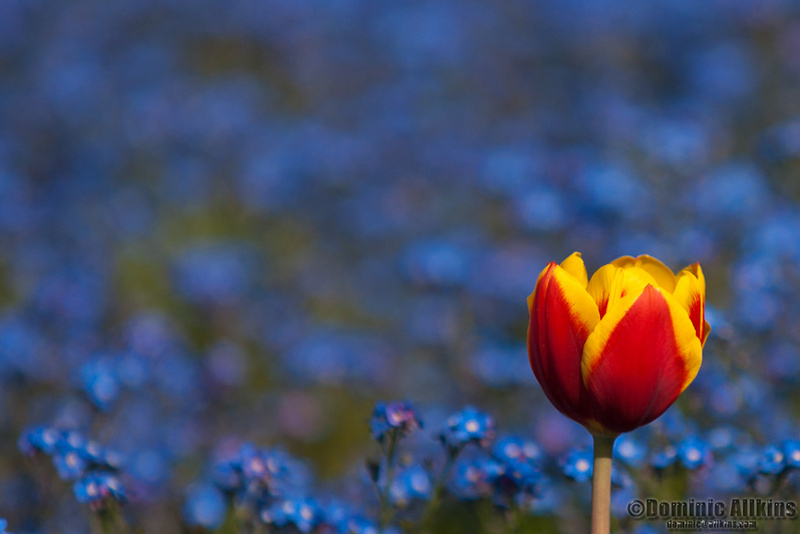 The core subject of a brightly coloured flower against an out of focus backdrop is attractive in itself, but how the shot is composed (or cropped as above) can have a dramatic effect on how the image is judged. All of the crops above reinforce the importance of the rule-of-thirds. While there are exceptions to all rules, this series of crops show how fundamental this rule is in photography. 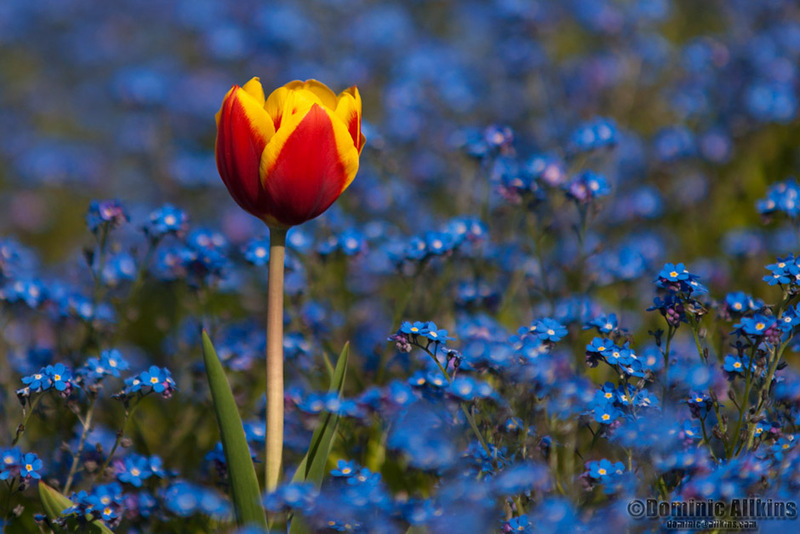 My original composition was a portrait shot with the intention of creating a crop similar to image 7.3 above – with the tulip in the lower right of the frame. Having now created a variety of different crops my final preference is the last image – 7.8. Having completed the exercise I then cropped the image for the feature section on the home page of the blog which has an aspect ratio of 920×350 rather than the ‘standard’ 6×4 aspect ratio of the camera sensor. Of all the images I actually prefer this version. The key learnings here are that the ‘standard’ 6×4 ratio does not always give the most pleasing image visually and that digital photography gives us amazing scope to ‘play’ with images – starting from a base to create a better image than maybe we had in our mind when we first took the picture. This entry was posted on Friday, July 23rd, 2010 at 10:12 and is filed under 02. The Frame, OCA Learning Log, TAOP Exercises, The Art of Photography. You can follow any responses to this entry through the RSS 2.0 feed. You can leave a response, or trackback from your own site.